At this time I have not yet found a lot of information about the 17th Airborne Reconnaissance Platoon. 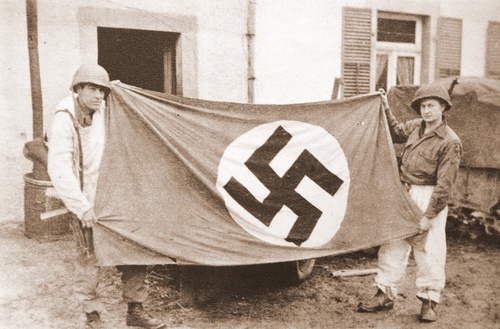 According the tesimony of Harry Boyle (466th PFAB), the Reconnaissance Platoon was created during the Battle of the Bulge. At this time, "D" Battery of the 466th PFAB was assigned to Division Headquarters to take missions of scouting and patrolling. This new unit took the name of Division Recon Company. I don't know if the right name is Platoon or Company ! This is below an excerpt from the unit journal describing the last days of the Battle of the Bulge (between February 1 and February 8, 1945) and two photos from "TALON with the 17th in Ardennes". 1st Lt. Knight at the head of a little reconnaissance patrol cleared the german forces from the village of Hautbellain (Great Dutchy of Luxembourg). He'll receive the Bronze Star Medal for this action again the enemy. Thursday February 1, 1945. This day the Recon. Platoon Command Post was located in the village of Siebenaler (north of the Great Dutchy of Luxembourg, Our sector). 06h00 : Cpl. Combs (?) with 10 men escorted and protected a Div OP team 3 Enlisted men of OP Team are members of this command. 11h00 : S/Sgt. George H Loss called to Div CP ordered to lead two O.S.S. men (Luxemburg) across the Our river into Germany. 11h00 : Capt. (Dudley ?) Hill received two missions from Lt. Col. Lyle N. McAlister (G-2). 1st platoon took both missions. Both patrols to cross the Our river and penetrate into the Siegfreid line. 1st patrol to observe the town of Preischeld (Germany). 2nd patrol to observe highway and hill in the Siegfried line. 20h00 : S/Sgt. Loss left 1st Bn. 507th PIR Command Post by foot on his mission. 24h00 : 2nd patrol observed enemy working on road on west bank of Our river, patrol leader reported to Div. CP. 00h15 : 1st patrol ran into enemy outposts on west bank of Our river. 11h00 : 24 Enlisted men and Lt. (Kenneth ?) Palmer sent to the rear, to a rest camp, for 24 hour period. 11h00 : missions came from Division for day and night patrols. Day mission given to Lt. John C Bradford Jr and 13 Enlisted men. Mission is to set up and operate forward OP and report by radio to Div. CP for route and location. Night patrol to be lead by Lt. (Denis ?) Jones and 20 Enlisted men. Mission to cross Our river and capture prisoner from fortified area (Siegfried line). Report a 1 enemy activity and installations. 12h45 : S/Sgt. Loss was requested to show 194th GIR the point he crossed the river on his previous missions into Germany. Request was granted and S/Sgt. Loss left CP to go to 194th GIR CP. 17h00 : Lt. Bradford's patrol returned to Co. CP with the following report. At 14h00 patrol had reached objective and were shelled with mortar fire. With the following casualties : Lt. Bradford slightly wounded, Pvt. Tutusko seriously wounded and Pfc. Dollars slightly wounded. All casualties evacuated to 507 Aid Station (Cpl. Combs will take over duties of Plt. Comdr.). 17h30 : S/Sgt Loss returned with the following information. Enemy has retreated to east of Dahnen and Dasburg. Area well booby trapped. A single strand barbed wire waist high. Rigged to send up flares and automatically fire a MG. trap is sprung by either cutting or pulling the wire. 03h00 : Lt. Jones and his patrol returned to Co. CP with the following report : "the Our river was too fast and wide to ford. Patrol set an ambush and laid in wait from 55h15 to 00h45 for enemy but no enemy was observed. Road block and mine field observed by patrol". 10h30 : mission received over wire. Objective to cross river and capture prisoner. Mission given to Lt. John S Knight and 1st Platoon. 15h15 : Lt. Knight secured two rubber boats from the 139th Airborne Engineer Battalion to use on his mission tonight. 16h30 : Patrol leader of tonight's mission requested artillery concentration on Dahnen at 04h00. 18h20 : Lt. Knight and 28 men left Co. CP to accomplish mission. 18h45 : Col. Campbell (S-3 Div. Arty.) phoned this CP state that request for barrage could not be granted and that the 6 Division would have a patrol in Dahnen tonight. Pfc Meitzler sent to contact patrol with this information. 21h45 : Meitzler returned to CP. He contacted Sgt Loss at river. Patrol going on as planned. 22h45 : Patrol returned to Co. CP was unable to cross river due to swift current and large ice floes coming down stream. 10h40 : received mission for tonight. Same as the last mission (see item at 10h30, Feb 3, 1945) except that we have to cross Our river in the 513th PIR sector. 10h45 : Lt Nammack (?) relieved as liaison officier. Cpl Rafter (?) is acting liaison officer. Lt. Nammack assuming duties of Plt. Comdr. 2nd Plt Cpl. Combs (?) reverting back to Plt. Sgt. 12h30 : G-2 requested Lt. Knight and Sgt. Loss for a mission. Mission was not disclosed to Capt. Hill. 15h15 : Lt. Palmer and man returned to CP. from rest camp. 07h00 : Captain Hill, 1st Sgt and Pvt Reining went to rear to take care of administrative details. 16h00 : S/Sgt Loss and 1st Lt. Knight with entire platoon on secret mission assigned by G-2. Mission unknown at this CP. 08h50 : Cpl. Rafter brought a field message from Div. stating we would send a combat patrol daily into Germany until further notice. 18h00 : Lt. Nammack and 12 Enlisted men left Co. CP. on mission. 01h30 : Lt. Nammack and his patrol returned to Co. CP. were unable to cross river. Patrol drew fire from Gemund. 10h30 : Lt. Palmer and 1 Enlisted man to report to Col. Good at G-1 by 12h00 today. Ordered to take 2 days rations and own transportation. These men are for a billeting party. 14h05 : Maj. Gen. Miley was at CP. for the purpose of decorating 1st Lt. Knight and S/Sgt Loss. Both awards are Bronze Stars. Battle of the Bulge - these two soldiers of the Recon. Platoon show a german trophy (TFH collection). 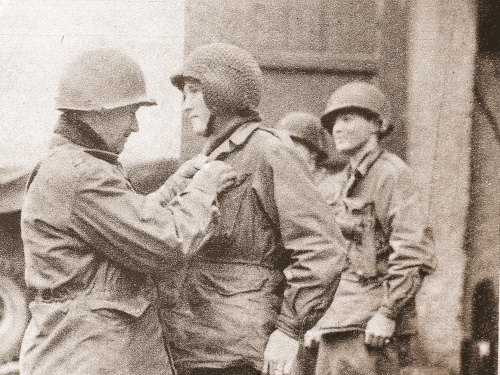 Siebenaler (Great Dutchy of Luxembourg) - General Miley decorates Lieutnant John S Knight Jr - Recon Platoon - with Bronze Star during the Battle of the Bulge, on February 7, 1945 while Division was still in Luxembourg. Note the very unusual use of one USAAF Flak helmet with net (TFH collection).